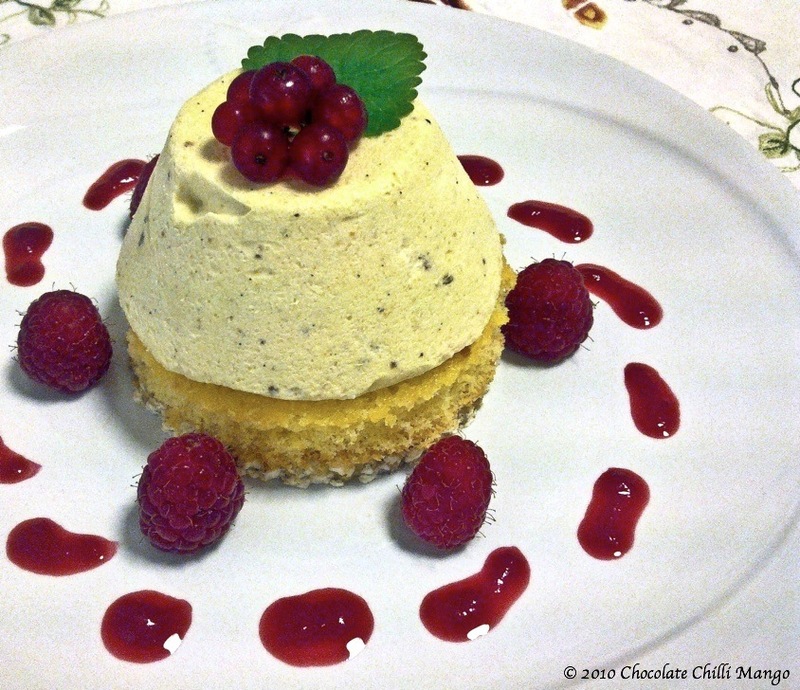 I made this semifreddo recipe as a base for our Christmas dessert this year and was asked to make it again for New Year’s Eve . I’m taking that as a good sign that it was enjoyed. I plated it differently, mostly to stop myself from having Christmas dessert dejà vù. I’ve included the recipe for the white chocolate and pistachio crispy as I used that on both occasions. The crispy texture of the base and the rich smooth ice cream are extremely yummy. I love semifreddo (parfait). It’s the only ice cream I make at home now, partly because everyone loves it, but also because it doesn’t need an ice cream maker or repeated freeze and beat sessions. It never sets hard and is always light and creamy. 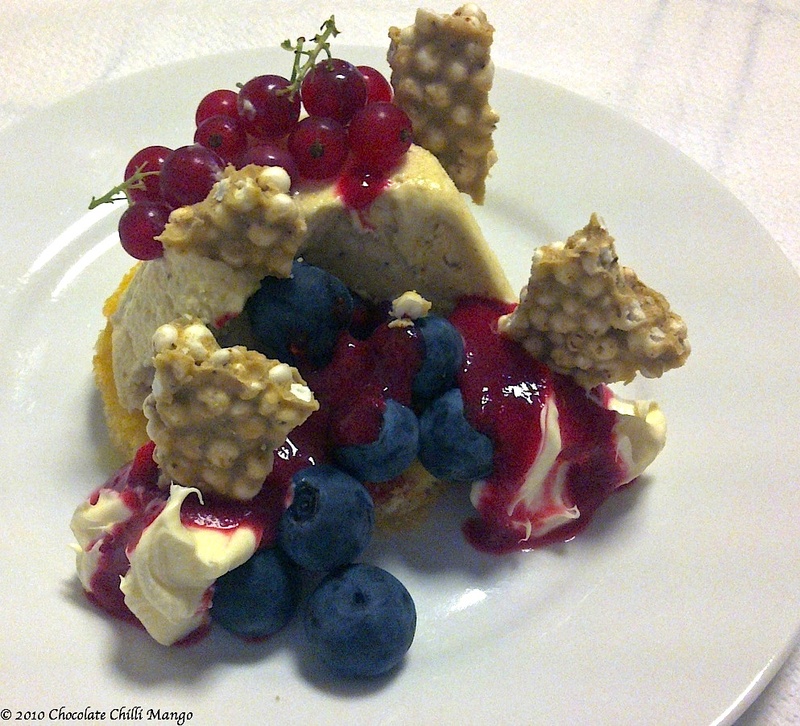 There is no bad in semifreddo land. It helps to have a candy thermometer for making the syrup. Combine the sugar and water in a saucepan over a low-medium heat. Let the sugar dissolve and bring to the boil. Do not stir. Place the egg whites in a bowl nearby. Have the egg yolks ready in a separate bowl. When the syrup has begun to boil watch it carefully. Insert the candy thermometer in the syrup and wait until it reaches 105℃ (35° Baumé). As you do this, beat the egg whites until they reach soft peak stage only. When the syrup is ready, pour half of it in a thin and steady stream into the egg whites, as you continue to beat them on high-speed. Set the remaining syrup aside, off the heat for now. Continue beating the egg whites until they are glossy. Set aside. You now have an Italian meringue! Return the syrup to the heat if required, just to melt it a little (it may start to set if it cools too quickly). Beat the egg yolks. As for the egg whites, pour the remaining syrup into the egg yolks in a thin steady stream as you beat them on high-speed. Continue beating until the egg yolk mixture is light and tripled in volume. Cover the meringue and egg yolk mixtures and place in the refrigerator until ready to use. Gently fold the egg yolk mixture into the cream with the whisk. While you can be a little heavy-handed, you still want to retain the lightness of all that air we’ve beaten into the eggs. Finally, gently fold in the meringue until no streaks remain. Place into a mould or airtight container and freeze until ready to serve. Place a sheet of non-stick baking paper on a large tray or use a silpat sheet. Place the couverture and butter into a heatproof bowl and melt in the microwave at 50% power or over a bowl of simmering water. If the latter, don’t allow the water to touch the bottom of the bowl. When melted, stir gently until smooth. Remove from the heat. Add the praline paste and mix it into the chocolate until well combined. Stir in the puffed rice until evenly coated. Tip the crispy mixture onto the tray or sheet and spread into an even layer about 40cm x 20cm. You can do this with an offset spatula or with a rolling-pin. You want a layer that is about 5mm thick. Cover and place in the refrigerator to set. 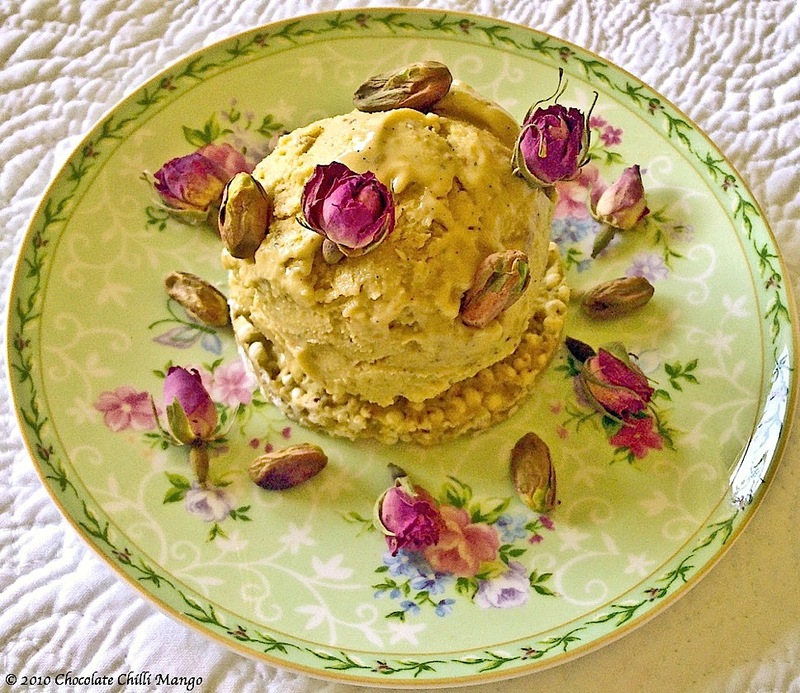 To plate up the dessert as in the main photo, you will need some fresh shelled pistachios and rose buds. It would be lovely with some persian fairy floss too. Place a crispy round on a serving plate. Place a large scoop of the parfait on top. 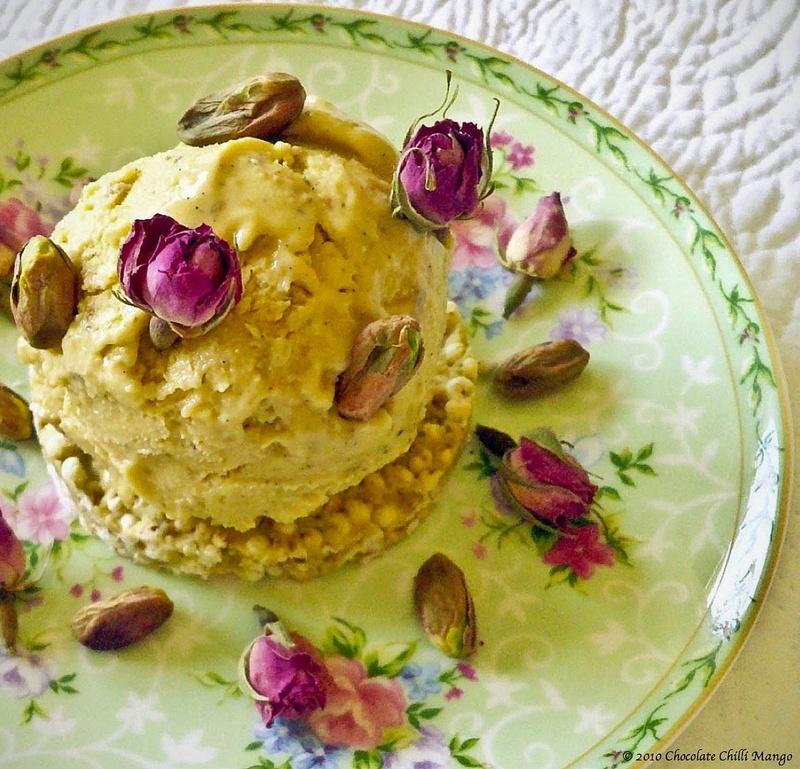 Sprinkle pistachios and rose buds over and around it. Simple! For Christmas I froze the parfait in individual moulds. Silicon moulds are the best for this. If you don’t have them, line the moulds with some cling film to make them easier to remove. I used simple muffin moulds and cut out the crispy to the same size – 7cm at the widest. When filling the moulds with the parfait, make sure to level the top. This will be the base of the parfait layer and it needs to sit flush with the bottom layers. Place a crispy round on each serving plate. Top with a round of sponge, cut out the same size as the crispy. I made my own but you can save time by using a bought sponge. If using a bought sponge, you might need to cut into 2 or 3 layers, depending on the height. You want the sponge layer to be about 1.5cm in height. Certainly no more than 2cm. Drizzle liberally with Limoncello liqueur. If you worry about the alcohol, make a syrup and flavour it with the limoncello. Unmold the parfait and carefully place on top of the sponge layer. Blend together one punnet of raspberries with the icing sugar and strain through a sieve to remove the seeds. Place the coulis into a piping bag or a sauce bottle with a nozzle. Decorate the plate around the parfait stack with piped raspberry coulis. 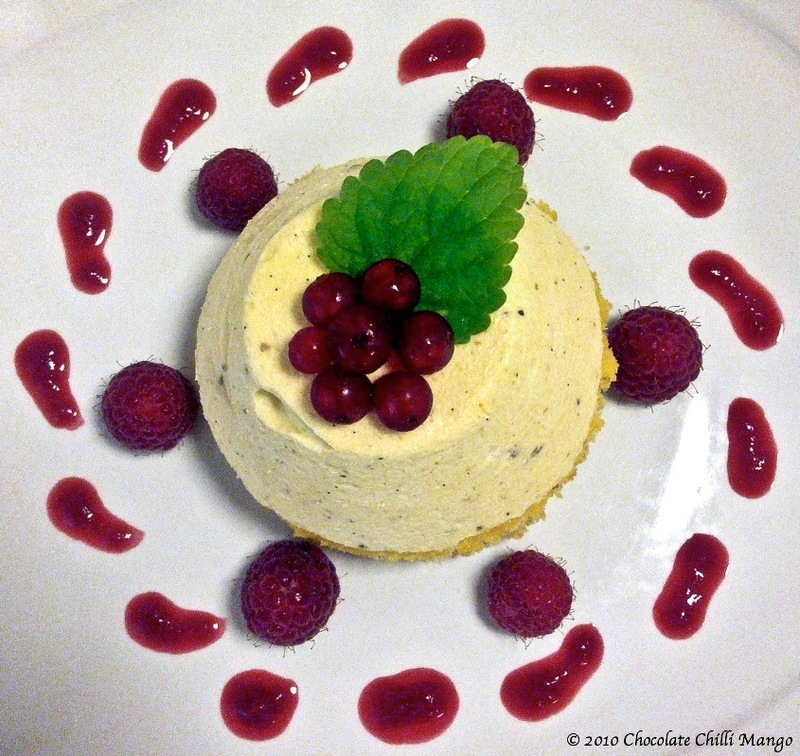 Decorate with extra raspberries and top the parfait with a sprig of red currants and the leaves to resemble holly. Leftovers the next day also made for a slightly deconstructed version of our Christmas day dessert. Cute, isn’t it? Apologies again for the quality of the photos and thank you for the kind and encouraging messages and comments! I won’t be winning any awards for photography but we’re really all here for the food, right? Hopefully you get enough of a sense of the yummy goodness 🙂 But guess who’s getting a camera for her birthday this year? Me me me me me….